Why is my gum bleeding? It is swollen, red and sensitive. Dental calculus (scale), that contains several bacteria, evolves due to the calcified pellicle that deposits on the teeth. The deposited quantity depends on the location of the teeth, the saliva consistency and also on certain inherited genes. It can be removed only with a professional technique. It results in gingival bleeding, foul breath and periodontal inflammation that may cause the slack then later the loss of healthy teeth. Periodontal diseases are endemic nowadays and they play an important role in the development of edentulousness. Dental scale looks yellow-brownish, in most of the cases it deposits on the upper molar (by the cheek) and the lower incisor tooth (by the tongue) as the outlets of salivary glands are located here. dental calculus that is located on the surface of the tooth is visible to the naked eye and yellow-whitish coloured. Its surface is rough therefore covered with pellicle that is danger to the gum, then later to the parodontium too. dental calculus located under the gum cannot be seen, it develops in the gingival pocket next to the tooth and is tangible only with special devices. It is black, very hard with a rough surface. It plays an important role in steady-state parodontinum diseases. It is removed with a special ultrasonic depurator. During its vibration it removes the dental scale from the tooth enamel, but does not damage the enamel. If necessary, we anesthetize the mucosa with lidocaine spray before the treatment. Dental calculus, that is located under the gum, is removed with a special manual device. After the treatment the tooth is polished with a professional brush and paste. Pellicle does not stick so easily to smooth surfaces, therefore – if the patient regularly brushes his/her teeth – a clean, calculus-free tooth surface can be maintained for a long time. 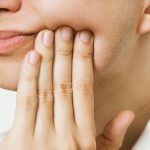 After the treatment, the neck of the tooth may be sensitive (to cold or warm temperature and sweet or sour tastes) for one or two weeks. It can be ceased with using fluoride gel, sensitive toothpaste or oral rinse. The time of dental calculus recurrence depends on the patient’s nutritional and oral hygiene habits. It is recommended to have an oral hygiene treatment in every half year. Intraoral sandblasting: for professional teeth cleaning we use Prophyflex (produced by KaVo). It blows a special mixture of smooth sand and water on a high speed level which removes painlessly the smallest dental calculus and tooth discoloration, too, even from the most hidden gaps. Besides polishing it makes a smooth tooth surface.